We were thrilled to see our Jersey Road project featured in the March issue of Inside Out. It is always a great joy to see months of design and careful planning come to fruition, and to be recognised in the press is a very proud icing on the cake. Here, we take you through the transformative journey of Jersey Road. Set amongst rows of Victorian and Federation homes, our Jersey Road project began its life as a very tired, red-painted brick terrace. Our lovely clients were in desperate need for a larger, lighter and more efficient home to accommodate their increasingly busy and bigger lives. 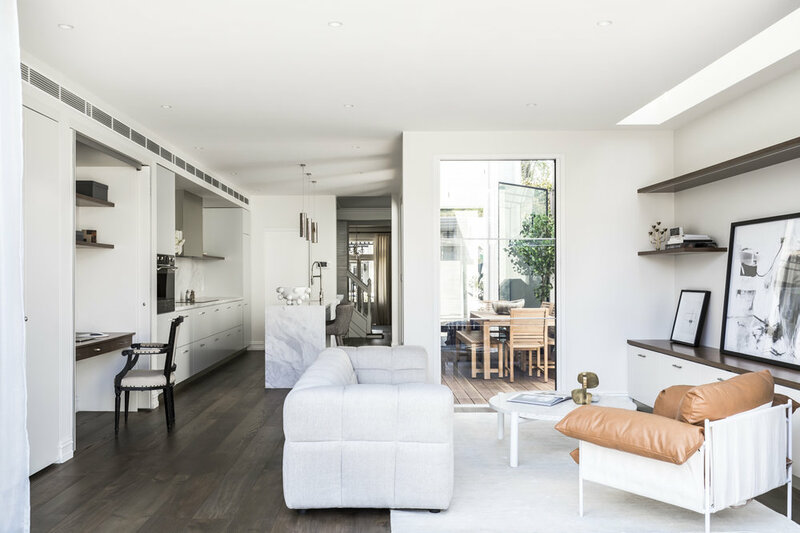 Tasked with creating a home where our clients could nestle in for the long term, we set out to retain what we loved about the house, while changing the scale of the spaces and introducing details that would feel relevant to a young family. To this end, we preserved the home’s heritage features, updating the classic exterior with a wash of powdery white and restoring the fireplace. Everything else was gutted, we brought her walls down, letting the house breathe a long-awaited sigh, so as to sit much more comfortably on her new larger foundations and in her now glowing white-rendered skin, optimising the space as well as introducing more natural light and fresh air throughout. 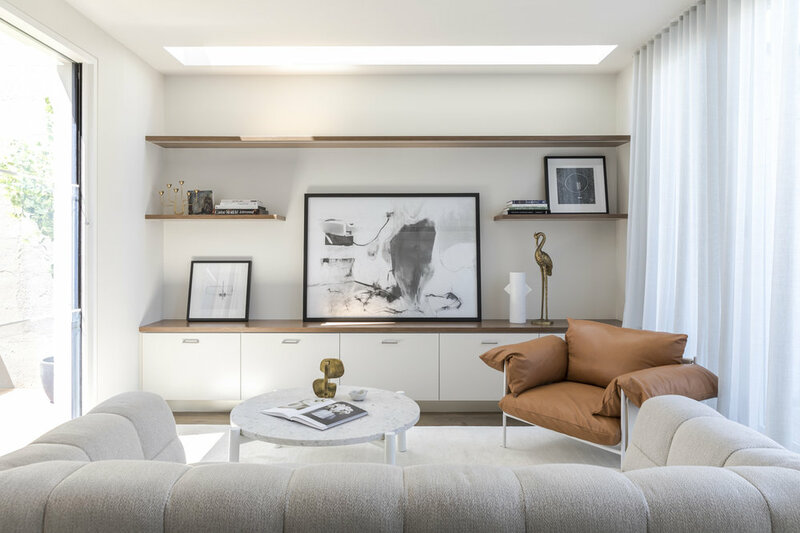 A calming palette of white and neutrals provides the perfect backdrop for the family’s collection of art and furniture, yet the home remains practical for a young family. Darker-toned carpets and textured, washable wallpapers predict sticky fingers. 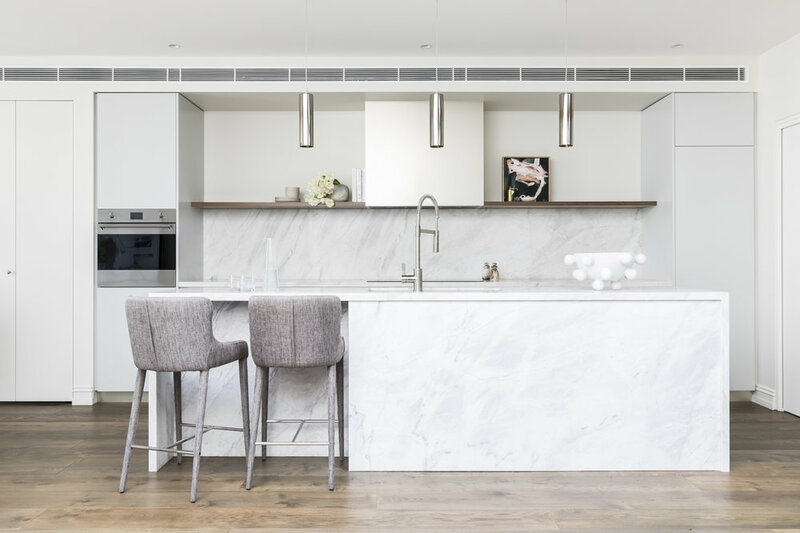 The kitchen was to become the focal point for this family of four, and so we created an inviting all-day zone that caters for breakfast, homework, dining and family time. 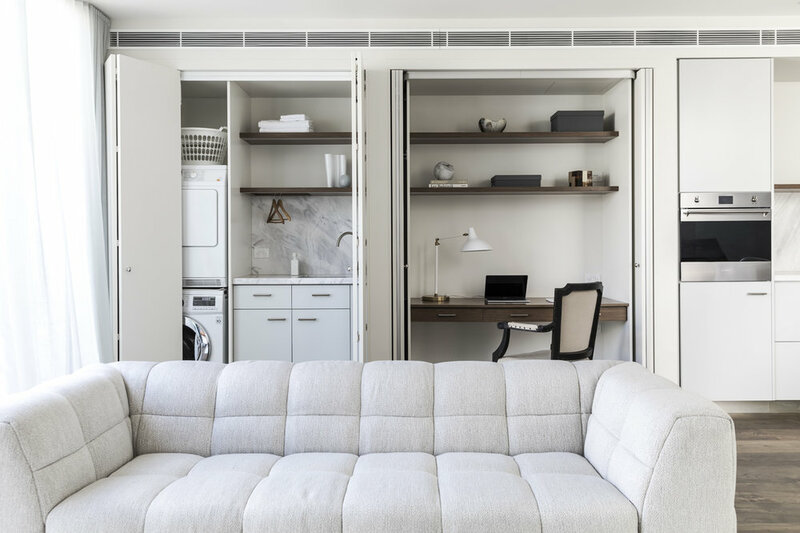 In keeping with the objective of making the kitchen the home’s central hub, we included both a laundry area and home office in the space, concealed with elegant bespoke joinery for a hide-away effect. To house the new dining room, we extended the heritage structure to include an independent glass and steel box. Conservatory-style windows flood the entire ground floor in light, bringing the outside in, and the starkly contrasting architecture adds a dramatic aesthetic without overshadowing the heritage charm of the original build. The two children’s rooms were such a joy to work on. 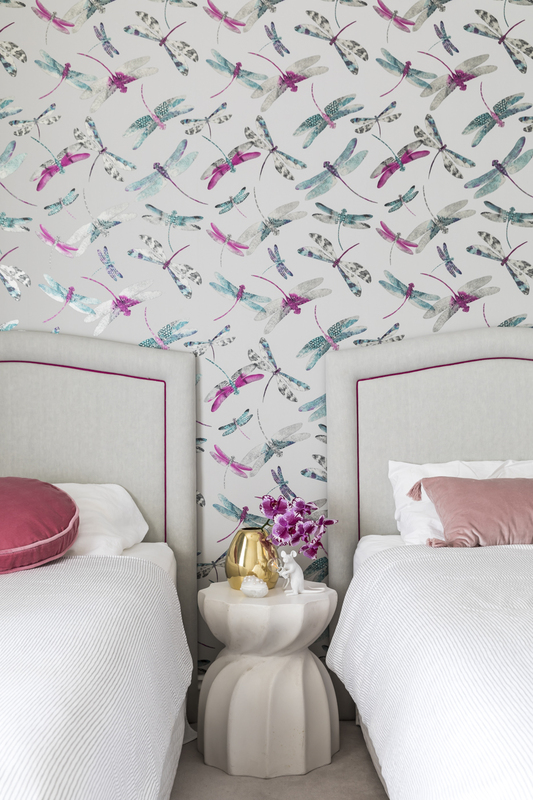 Colours are drawn from each child’s favourite, manifesting in whimsical wallcoverings and playful rugs. As the months of intensive renovations passed we saw the terrace transform inside and out, where she now stands firmly proud in the middle of her lively street. The home now offers a perfectly balanced combination of traditional and modern details, conveying a timeless and relaxed feel.